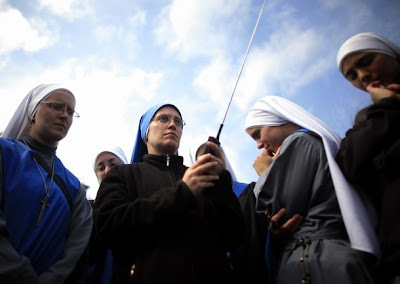 Catholic radio workers are at the service of the word of God, he said, which involves a "patient sowing, carried on day after day, hour after hour." The pope said in his address that sometimes the humble Gospel message Catholic radio aims to deliver may seem to get "completely lost amid the competition of other noisy and more powerful mass media." "But do not be disheartened," he said. "You are sowing the word in season and out of season" to countless people. Thanks to Catholic radio broadcasting, the Gospel can bring consolation to the lonely and the words of salvation to those who have never heard the name of Jesus Christ, he said. The pope said it was important to make the Gospel message attractive to the men and women of today so that it could touch their hearts and transform their lives. The president of the communications council, Archbishop Claudio Celli, said the congress aimed to help radio stations rediscover their mission of evangelization, fulfill their service to the Catholic community, and foster understanding and solidarity among all peoples. Participants also wanted to see how Catholic broadcasting or programming could reach parts of the world where it is lacking, he said in an interview in the June 19 edition of the Vatican newspaper, L'Osservatore Romano. Financial or even legal restrictions sometimes prevent bishops' conferences from setting up a Catholic radio station, he said. While Latin America has about 3,000 Catholic stations, Africa has only about 150, he said. Some countries in Africa and Asia do not allow radio stations that have any religious affiliation, the archbishop said. Australia and Ireland do not have any Catholic radio stations, but religious programming is allowed, he added. The secretary of the Vatican Congregation for the Doctrine of the Faith, Archbishop Angelo Amato, said the radio medium is like a "modern-day pulpit." He said in his June 19 address that Catholic programming can "educate and edify" the Catholic faith, filling in the gaps where traditional places of formation -- like the family, schools and society -- fall short. Catholic broadcasters must announce the word of God "unequivocally, clearly and professionally" and spread and pay witness to the truth, he said. That way Christ's message will not be seen as being "just one opinion among others, but as truth that forms opinion," Archbishop Amato said. He said that along with music, news and information, Catholic radio should host debates concerning pressing issues like the right to life, bioethics, scientific discoveries and the lack of ethical public policies. He said through its words Catholic radio must help heal the "spiritual deafness" in today's world.